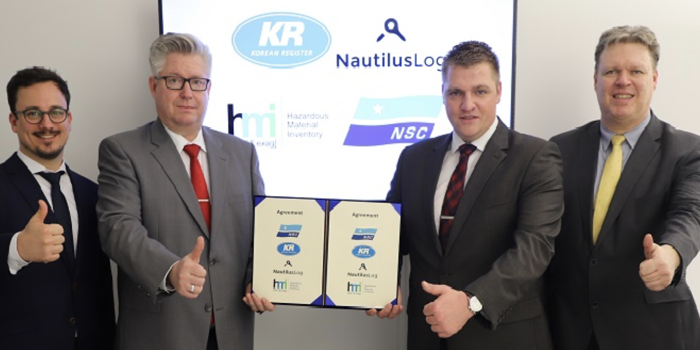 NSC Group has signed an agreement with Korean Register (KR) for the IACS (International Association of Classification Societies) classification society to provide IHM (Inventory of Hazardous Materials) services across the NSC Group’s fleet of container vessels, bulk carriers, conbulkers, car carriers and tankers. From December 31, 2020, all existing ships sailing under the EU-flag and ships flying the flag of a third country calling at an EU port or anchorage must have on board an inventory of hazardous materials (IHM) verified by the relevant authorities or a recognised organisation like Korean Register. The same rules came into effect for EU-flagged on 31 December 2018. The regulation will improve safety, protecting people and property onboard the ship and meeting any mooring requirements. KR will be working with partners HMI GbR (QSU & exag) and NautilusLog GmbH to deliver the specialist IHM service. Many shipowners and operators have yet to decide on IHM service providers, but the KR partnership is well established with plans for future projects already underway and many new ideas to benefit customers in development. HMI GbR (QSU & exag) is an established service supplier approved by KR, with many experienced in-house Hazmat experts ready to inspect and serve the entire NSC Group fleet across the company’s worldwide network. NautilusLog GmbH has recently won several awards including the Hamburg Innovation Award, Pitch Blue Award by VDR and Digital Logistic Award. An IHM report will be linked to the entire lifespan of the vessel, eventually covering the building stage, its operational stage and the recycling stage.